I have to have deadlines, ‘assignments’ if you will, in order to get things done. I learned this after we moved here. I didn’t have friends, family, school, job or kids to keep me occupied. You’d think I’d spend all that time working on my art, arts & crafts projects, cooking nice meals, etc. Oh no. I slept for almost 6 months straight. Which means, if I don’t make it to a baby shower, bridal shower or any sort of gift-giving event, I have ZERO motivation to work on a present. Translation: I missed a friend’s baby shower in August. I just finished making the gift and gave it to her on Saturday. I’m such a dork. My friend’s little boy is 4 months old, and catching up to Penelope quickly, so I made a Kimono that fits Penelope, and maybe baby Will will be able to wear the fuzzy sweater more than once before he’s too big. I like how it turned out. The fleece made the project easy for finishing, and great for this kind of wet-cold weather we’ve been having recently. Want to make your own? HERE’S THE TUTORIAL. It’s fabulous. i am the same way… if I don’t have a billion things I HAVE to do, then NOTHING gets done. darling kimono. i love it! Care to give me a deadline for when I will be done with my abstract this week? I didn’t realize how big Will was getting! Penelope fits into the kimono sweater too?! It’s fits Will perfectly, and I was so glad to have it when I took Will on a walk the other day in freezing (probably 45) weather! Sometimes it’s better timing to give gifts late because that’s when they really need it. I’ve done that with a few wedding gifts before…ok, not on purpose. This is adorable. I wish I could understand the directions as well as you! I love it!! 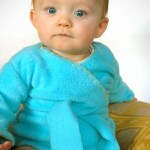 I love making the kids clothes in fleece as it’s so easy to work with and so cosy. I’m afraid I am very confused with the instructions though – I hope someone does a easy follow tute with pictures for us beginners!